I am currently re-ordering this site , to turn it into a more user-friendly Jupiter/Uranus research archive, in preparation for when the study I have been running since Spring 2010 comes to its conclusion – in Spring 2011 as the new Jupiter/Uranus cycle in Aries gets into its fiery stride! “This is a study of real-life astrology”, as Ken Gillman says in his foreword. Observation of what actually takes place on Earth when particular planetary alignments occur in the Heavens is of critical importance in determining whether astrologers’ theories about what should happen are borne out empirically. Our tradition has depended on the validation provided by actual observation of planetary effects since those Chaldean priests “…six thousand years ago, when the human mind was still half asleep…were standing on watchtowers, scanning the stars…”. This book continues that ancient tradition by presenting a comprehensive study of the conjunction of Jupiter and Uranus which took place in February 1997 at 5 degrees 55’Aquarius. Jupiter and Uranus meet every fourteen years. When they do, revolution and innovation join forces with restless exploration and the quest for knowledge.The result is always exciting, educational and unpredictable. Or is it ? Anne Whitaker, never one to take anything at its face value, decided late in 1996 that she would observe the effects of this approaching planetary event and investigate whether it lived up to its reputation according to the textbooks. Her method was straightforward. Watch world events around the time of the conjunction, and during the rest of 1997 which continued to be dominated by Jupiter-Uranus energy. Find some volunteers with the 5 degrees 55’ Aquarius Hot Spot highlighted by a planet, Angle or Moon’s Node in their natal horoscope. Collect their stories during the year of the conjunction’s operation, and see whether the same core“Jupiter-Uranus effect” could be detected in all their different lives. The first version of her research was published in “Considerations”magazine (USA) during 1999-2000, and was well received by its world-wide readership. But Anne continued her work on the conjunction, setting it in its historical and mythological context for a seminar she gave at the Centre for Psychological Astrology in London in June 2000. Right through to the end of 2001, she did more research exploring the impact of Neptune’s transit of the 5 degrees 55’ Aquarius Hot Spot, again from both a collective and an individual point of view. Nine of the original seventeen volunteers stayed with the study throughout. Their disrupted, exciting, turbulent life stories form the core of this vivid exploration of the interface between planetary activity and human life, during a period in which the startling announcement of the birth of Dolly the Sheep in February 1997 indicated that advances in cloning and genetic engineering were taking us on a voyage never before undertaken by humanity. This highly original book, written in a pacy and accessible style, will be of particular interest to research-minded students. It will also appeal to astrologers looking for specific evidence that the personal and collective lives of humankind respond in the same core way to the great music of the spheres, played throughout space and time by the planets in their cycles. 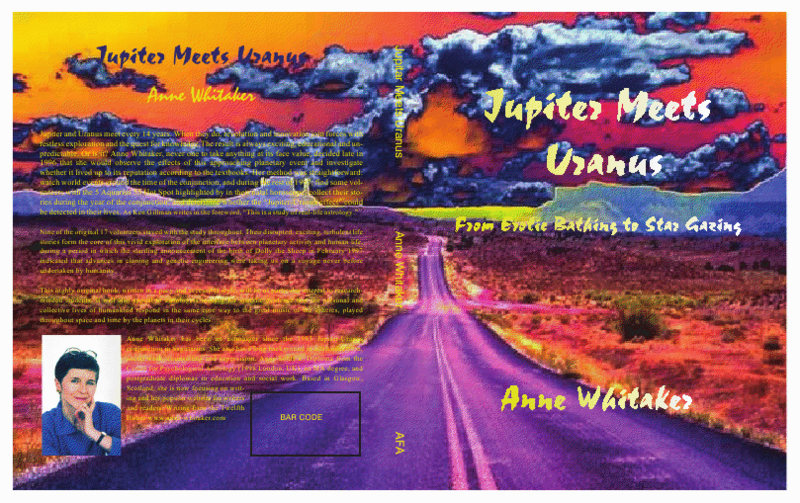 followers of this site will be aware that Anne is continuing her research into Jupiter/Uranus conjunctions, via recording the life stories of ten volunteers from around the world whose horoscopes are “plugged in” to the 2010/11 conjunction in Pisces and Aries. However, the book “Jupiter Meets Uranus” remains a useful reference tool for anyone interested in how planetary energies play out in both world affairs and the ‘ordinary’ lives of you and me. This entry was posted in 2. Introducing "Jupiter Meets Uranus"(published AFA 2009). Bookmark the permalink.